Beckingham Village - Steaming through Beckingham! On Saturday 21st June 2008 two of the three remaining Class A4 steam locomotives that are still capable of pulling passenger trains passed through Beckingham to the cheers of a small crowd. In the late morning 60007 ‘Sir Nigel Gresley’, pulling one coach, passed through with a blast on his chime whistle (Oh heavenly sound!) travelling from Doncaster towards Lincoln. This locomotive was built at the Doncaster Works in November 1937. It was built to Sir Nigel’s design and later it was decided to call it ‘Sir Nigel Gresley’ in his honour. Today the train is based on the North Yorkshire Moors Railway and over the last couple of years has undergone major overhaul to mainline standards to include work on the air braking system, on-train monitoring and recording equipment and train protection warning system. 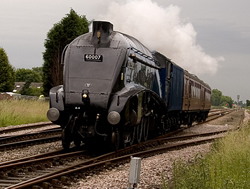 The ‘Sir Nigel Gresley’ locomotive in its striking BR blue worked the East Coast main line, Kings Cross to Edinburgh, for most of its life, until it was withdrawn from service in February 1966 and rescued from the scrapyard by a small group of enthusiasts called the A4 Preservation Society. Today the Sir Nigel Gresley Locomotive Preservation Trust Ltd is dedicated to keeping the locomotive running and preserved to run in front of special excursion trains. On its return journey the 60007 pulled a fifteen coach train from Lincoln to Kings Cross via Sleaford and Spalding. At about four o’clock the sound of a chime whistle was heard again, and 60019 ‘Bittern’ roared over Beckingham Level Crossing on its way to Doncaster. (Many of the Class A4s were named after birds). Again, it was pulling only one coach. ‘Bittern’ was built in December 1937 and like most of her class worked the East Coast main line until September 1966. ‘Bittern’ and 60024 ‘Kingfisher’ were the last two A4s to be withdrawn. However, ‘Bittern’ was purchased privately and saved from the scrap man’s cutting torch. During the morning she had pulled a fifteen coach special excursion from Kings Cross to Lincoln, via Newark. The Class A4s have a coal capacity of nine tons and need five thousand gallons of water to keep them running. Of the thirty six of the Class made only six now survive. One each in museums in America and Canada; ‘Mallard’ in the National Railway Museum at York, and ‘Sir Nigel Gresley’, ‘Bittern’ and 60009 ‘Union of South Africa’, all of which can occasionally be seen passing through Retford on main line excursions. Oh Yes, Why were they pulling only one coach when they passed through Beckingham? The coach carried the support team who look after the Loco, feeding it coal and water, oiling its moving parts, blowing its nose etc.